Pickett’s Charge, one of the most famous events of the American Civil War, has been described as the high water mark of the Confederacy, and the turning point of the war, after which it became increasingly clear that the South could not win. On the third day of the Battle of Gettysburg, some 12,500 confederate infantry advanced about a kilometre towards a well-defended Union line, all the time suffering from musket and cannon fire. Few reached the objective, and they soon had to retreat or surrender, but the horrific casualties (over 50%) and the perceived futility of the attack right from the start, meant it has remained in the American consciousness to this day. However it was far from the only example of formed infantry suffering huge losses as they approached a defended position, and countless thousands on both sides lost their lives using Napoleonic tactics against modern industrial weapons. In terms of poses there is nothing unique to Pickett’s Charge, so this is basically a set of advancing Confederate infantry with a convenient label. 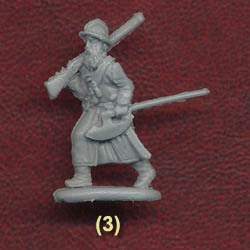 All the common poses in this set are moving forward with musket on the right shoulder, which was certainly how men sometimes moved forward, and presumably will have done so at Gettysburg. One source states Pickett’s men moved forward with port arms (muskets held across the chest), and naturally as contact with the enemy came near bayonets would have been lowered, so this set is far from a complete depiction of the event (although of course this is only 'set 1'). The various forms of the main pose are quite a mix, and some we found rather awkward and unnatural. 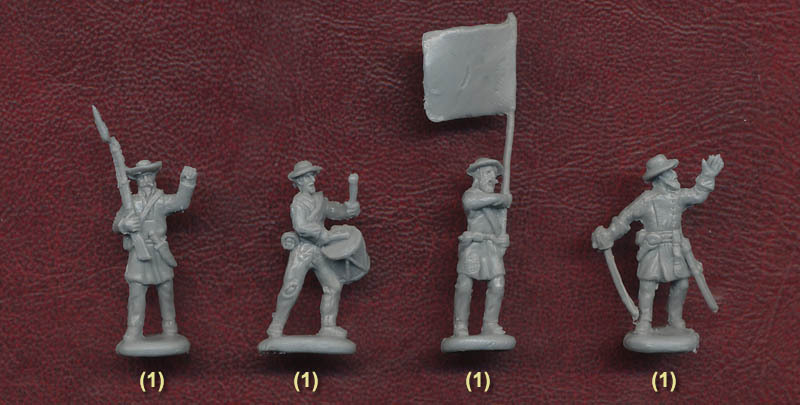 The middle figure in the top row has a very odd posture, and the last figure in the second row holds his musket so high that it would be difficult to handle and uncomfortable, though not necessarily incorrect. Essentially these men are adopting the 'Right Shoulder Shift Arms' position, but many are not doing it very well. In particular many have the musket much lower than they should, increasing the potential for harming the man behind. The right leg is forward in all cases, which is understandable in terms of moulding the figure, but does not look natural when grouped together. For similar reasons all the left arms are tight to the body, which looks alright on individual figures but again looks odd when everyone in a group is doing it. However one correct feature is most of the men are walking - despite being called a 'charge' the men would only actually charge towards the end of the advance. The six single-copy figures provide a bit more variety and some welcome command figures. The first two depict a man being hit and another with musket lowered and left arm in the air. The casualty is reasonably believable, though we do not like the effort manufacturers often make to include the dropped weapon on such figures. The second man could make a good NCO, but is a perfectly good pose however used. The first figure in the last full row is odd, and we couldn't work out why he holds his left arm in the air making a fist. Not unusable of course, but an odd choice. The drummer, flag-bearer and officer are more conventional, and all perfectly good. The Confederate States only had a tiny regular army; most troops were from the Provisional Army, made up by the individual states. Differences in regulations between the states accounts for much variation in the appearance of the troops, but so do difficulties of supply and the natural loss, scavenging and improvisation of the men themselves. The majority of Confederate soldiers wore a short jacket of various styles, which is nicely reflected in these figures. A few seem to have just a shirt, or a longer hunting-style shirt. Many have a brimmed hat, and others the classic kepi cap. The designer has gone to some lengths to depict common habits such as the trouser legs tucked into socks on some, and the man who seems to have string tied round his waist in lieu of braces perhaps. There is a wide assortment of packs, haversacks, water bottles and pouches scattered throughout these figures, and we were particularly pleased to see several with visible knives and others with a blanket rolled across their chest. Each figure is different in some respect, and very well thought out. The officer has a brimmed hat and frock coat, and also a sash, which was regulation but may have been less common in the field by this date. The sculpting is OK, and certainly with none of the chunky feel of old Strelets figures. Detail is quite good, but these are not the most attractive figures ever made, and we thought some rather long in the leg. Occasional problems include the wounded man losing a strap at the back, and the very simple rope arrangement on the outside of the drum, which has no 'ears', and while not impossible would certainly be very untypical. Also we were not thrilled by the tufts of grass placed where a foot is off the ground, though these can at least be trimmed away. The choice of poses means there is no excess plastic anywhere, and flash is very low level too. The flag seemed too small to us, and certainly it would not be a national flag, particularly as it is also square (about 12mm each way). However there were many Confederate battle flags that were square, so this could well be one of those, though we would still have preferred something a bit bigger. The flag is not engraved with any design, and more-or-less flat. With reasonable sculpting and no accuracy mistakes this set has much going for it. However while the basic repeated pose is fine some of the variations are quite poor, so we had mixed feelings about these figures overall. Hopefully Set 2 etc. will provide some more advancing poses which will help to depict the actual event much better, and a little more thought into the likelihood of those poses would not go amiss either.